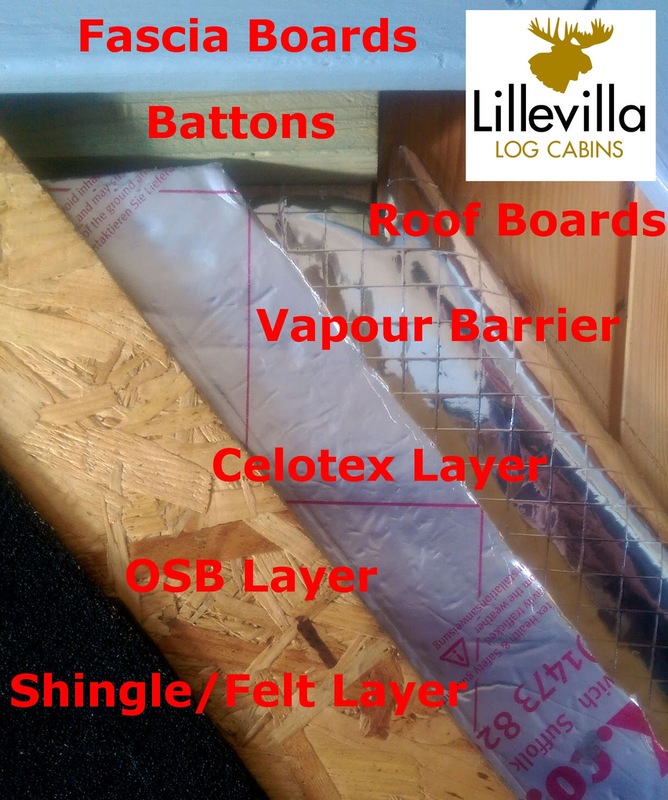 This Blog will explain how to install roof and floor insulation into your Lillevilla Log Cabin during the build process. With the floor insulation it is imperative that this be installed before the floorboards go down. 1. To hold up the insulation off of the floor you need to put a nail, screw or some other kind of baton 25mm down the floor bearer/support. a. At this point you can install some extra baton/timber between the ends of the bearers to hide the insulation from view. 2. You need to put one of these into the bearers at least once every 400mm. Whilst the minimum is one support every 400mm you could put more in if you wished. 3. After the supports have been put in place you will need to cut the insulation board to the required sizes. These will then slot between the floor bearers and rest on the supports you put in earlier. 4. Once the insulation is in place and flush with the top of the floor bearers you will need to use foil tape to seal any joints between the insulation and the bearers. a. Please note that you will have the damp proof course (DPC) layer resting on top of the floor bearers. This is perfectly fine as the tape will connect to that as well. 5. You are now ready to install your floorboards. The roof insulation, unlike the floor, can be installed after the cabin is built but it gives a better finish when you install it during the cabin build. If we are supplying your roof insulation, then we also provide all the items I will mention below. 1. The first step is to build your cabin up until the roof boards have been laid. 2. You will then need to lay the vapour control layer (VCL), which is the foil sheet, over the roof boards and secure this down with the foil tape. 3. Then you need to attach batons the whole way around the top edge of the roof. This insure the VCL stays down as well as providing a barrier for the insulation. 4. After that you can lay the insulation board on top of that, using the previously installed batons as your guides as well as stoppers. 5. Then you need to use the foil tape again to seal all of the joints between the insulation boards as well as the batons. 6. At this point you can lay the oriented strand board (OSB) over the top of this and attach it to the batons. 7. After this you just need to lay your roofing material over the top and attach any fascia that are provided with the cabin, detailed in the build guide. Please not that with the increased profile of the roof the fascia boards don’t always cover the whole of the roof purlin/support beams. This is perfectly fine and as long as the ends purlins are treated like the rest of the cabin then they will be just fine.